It’s no secret that there’s a certain je ne sais quoi when it comes to French style. It’s polished yet effortless. Classic yet cool. And it always seems to highlight a figure in just the right way. From Jeanne Damas to Anne-Laure Mais of Adenorah, the elegant-meets-badass style that’s unequivocally French has been the source of numerous double-taps and outfit pinnings for years. So who better to illustrate Parisian slimming styling secrets than the French trendsetters themselves? Equip yourself with these need-to-know tricks, and you’ll be perfectly poised at all times. Keep reading to find out the 12 slimming style rules we've noticed all French girls follow. Style Notes: Cinch in any waist with a belt to make the most of your proportions. It's the easiest way to give your outfit a feminine, and flattering, twist. The perfect belt for creating that flattering silhouette. Style Notes: It makes sense—vertical stripes will make your body look longer, thus making you look slimmer. Don't forget to pair the Zara Striped Suit Trousers (£18) with the top too. Style Notes: Take a tip from Caroline de Maigret who wears this light jacket to make her look taller. Layer a denim jacket under this when you get a bit cold. Style Note: Trust that well-tailored flares (that aren't too tight or too baggy) can balance out hips and lengthen pins. The seam down the middle just gives these jeans the tailored edge. #5: A wrap dress or skirt gives your waist definition. Style Notes: Even if you're wearing a plain tee, there are ways to accentuate your waist. This is the skirt we've seen all our favourite bloggers wearing, so we suggest you snap it up, stat. #6: Match your trousers to your shoes for endless legs. Style Notes: Want to appear like you have legs for days? Take a tip from It French girl Jeanne Damas and wear the same colour shoes as your trousers. Perfect for the office or a night out. The velvet trend isn't dying down any time soon. Time to invest. #7: Accessorise with a long scarf. 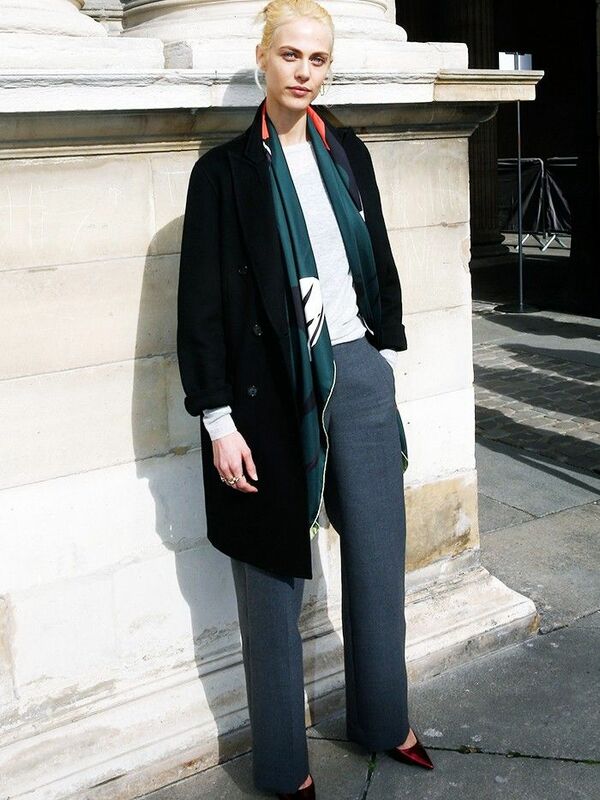 Style Notes: Do what Adeline Rapon does to lengthen her torso and add a long scarf or necklace. Olivia Palermo is also a fan of this trend. It doesn't even have to cost much. #8: Pair high-rise pants with a short top. Style Notes: If you want your legs to look like they go for miles (and let's face it, who doesn't? ), wear a pair of high-waisted trousers with a short top. Super chic trousers that you'll wear again and again. You can also wear this with a pair of high-waisted jeans. Style Notes: This is en vogue right now, and it's insanely flattering. We can't believe this is only £50. #10: Select classic pointed-toe heels. Style Notes: This heel style gives extra lengthening effects. You'll be asking yourself why you didn't have a pair of these in your wardrobe already. #11: Always have a pencil skirt on hand. Style Notes: Pencil skirts that hit below the knee are the most flattering for all figures. A white tee tucked in will look effortless and elegant. Style Notes: Do this via cutout details that emphasise your smallest parts. The shoulders and the middle cutout just show off the right amount of flesh. Want to nail Parisian style? Check out the eight fashion rules French women stick to.